Promotion? We should be so lucky. Take a rabbits foot, add some lucky heather and a horseshoe, and it still wont account for the amazingly lucky escapeÂ that CD Tenerife had to spare their blushes. Losing 1-0 at home to bottom side Poli Ejido, it took 2 goals from free scoring forward, Nino, late in the game to keep the promotion dream alive with a 2-1 win,Â and restore Tenerife to 7th spot. Coach Oltra had promised big changes after last weeks awful 4-0 away hammering at Eibar, but surprisingly the only big change was in goal where the outstanding Juan Pablo was replaced by Raul Navas. Tenerife had a poor first half and made Poli Ejido look good, and of course they grew in confidence as the game went on. Nino went close after 20 minutes but Ejido had plenty of chances too and looked the hungrier side. Going into the second half all level, Tenerife continued to pump high balls up front with little chance of any result. The unthinkable happened after 60 minutes when Chico netted a rebound for the visitors and Oltra responded by bringing on Arruabarrena to give Nino some help up front. The big forward made his prescence felt and had 2 good chances before setting up Nino after 80 minutes, Nino nipped in and made sure the ball went in the goal, and the great escape was on. Just 2 minutes later and the same combination worked again with Nino again poaching a goal to give Tenerife a lead they hardly deserved. Thankfully that killed off Poli Ejido and the game ended with a huge collective sigh of relief for Tenerife. Next Saturday is the big derby game away to Las Palmas, and with the Pios winning 3-0 away this week, Tenerife will have to raise their game. A travelling army of 1,800 fans will make the short trip over, we just hope that the players “turn Up” even a repeat of last years 0-0 snore draw would be acceptable. And the good news is, the sea is looking very choppy at the moment , that ferry journey should be quite lively. Vamos Tenerife. You know what it’s like, your 96 years old, weigh 50 tons, you’ve burst your boiler and no one wants you anymore. What you really need is some friends. 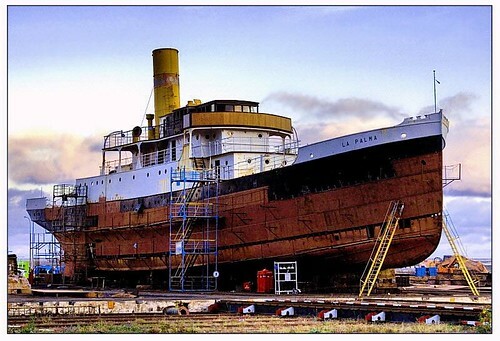 Thankfully the steam ship La Palma found them in Tenerife in 2003, when a restoration trust was formed to restore the Middlesborough built vessel and repay it for years of service between the 7 Canary Islands. I met some of the trust members last year and was looking forward to the re-launch from it’s Santa Cruz dry dock this year, but it has just been revealed that they need another 3 million euros to give it a 2010 return to the sea. Launched from the W.Harkess and Son shipyard in 1912, just 4 days before the Titanic sunk, La Palma headed for the Canaries to begin 60 years shuttling between the Canary Islands and Spanish West Africa, delivering mail, provisions and news. Although sturdy and functional, the ship had bags of style inside, including Chippendale style furniture, brass instruments, a sweeping staircase and first class cabins. It all came to an end in March 1976 when one of the boilers that fired the triple expansion steam engine, blew up, forcing the ship to limp into Las Palmas, Gran Canaria. 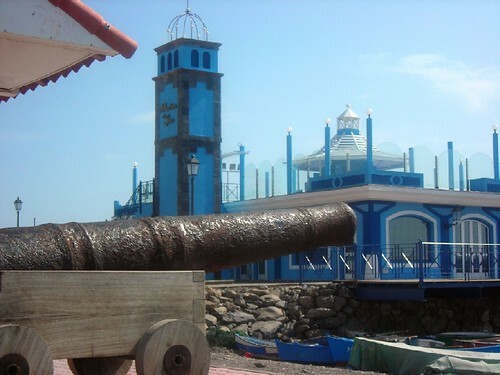 Years of neglect, rust and looting followed until the trust was formed in 2003, with the aim of restoring La Palma as a floating museum, restaurant and tourist attraction. Governments of all 7 islands chipped in and private benefactors joined the trust. The near 5 million euros raised has paid for a lot of major structural work including parts of the riveted steel hull, but there is still a lot to go. The trust are working hard to collect more funds and finish the project. The cruel and unpredictable nature of the sea tends to harden seafaring people but when La Palma finally enters the water, with a new life to look forward to, thousands of hearts of oak will swell with pride. 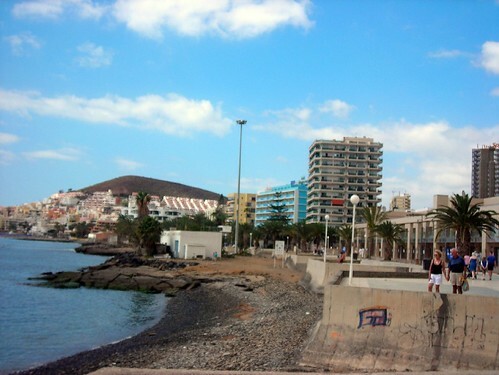 A tale of 2 Los Cristianos beaches. It was all happening down at the beach on Saturday. The political big guns were there on Los Cristianos old beach, and there wasn’t a towel or a pair of trunks between them. Mayor Reveron of Arona, the director of Tenerife coasts and assorted councillors were discussing the April closure of the beach for a clean up, it does tend to trap rubbish washed down by the rains, plus oil and debris from all the small boats moored up. At the same time, to the east, just past the sailing school, a small section of beach was sealed off for a while as Barranco de Aquilino poured out white foam, caused by someone emptying a private swimming pool. Keep heading east, and there is a much bigger topic of discussion. Los Tarajales beach (above)Â rough and pebbly, stretching from the barranco to the Costa Mar Hotel, has been given hope of a 12 million euro facelift. Plans were discussed, in the prescence of the mayor, Â a week ago at the Arona Gran Hotel, in front of local hotel owners. The scheme would take 2 years to complete, and provide new sand, 2 pools on small headlands and the building of breakwaters off the coast to calm the sea for the benefit of bathers. A make over has been promised before over the last 6 years but never came to anything, but this time there seems a new determination. The coastal authority is on a crackdown to remove buildings that break the 1988 law of the coast by being less than 106 metres from the shoreline, and there are a few old homes, still lived in, on the beach, as well as commercial shops and apartments nearer to the barranco. Just behind the beach there is also a sealed off block of 26 business units, all with apartments above, that has never been opened. New entrants to this contest are the Los Cristianos neighbours group led by Leopoldo Diaz Melo. They are objecting to Los Tarajales being modernised as it would over commercialise the natural beach which is so close to MontaÃ±a Guaza, the councils plans estimates the improved beach could hold 5,000 sunbathers. The neighbours also say the breakwaters will stop the natural tidal turnover of the sea and could lead to water stagnating. So, the battle lines are drawn, this has all the ingredients for a long drawn out wrangle, and it seems impossible to please all sides. Sometimes you almost feel sorry for these councillors and politicians – I did say almost!. Contrary to popular belief, Easter isn’t just about The Great Escape, never ending Bond movies and chocolate eggs. 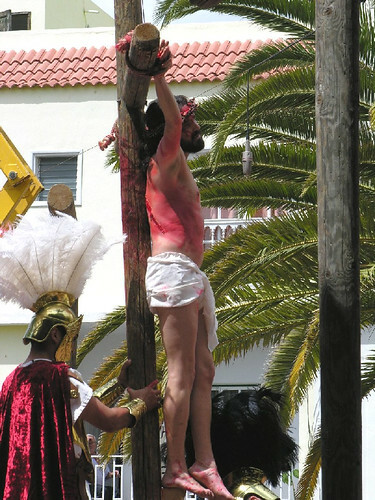 Here in Tenerife there are strong visual reminders with performances of The Passion, the last hours of Christ. One of the biggest and most praised took place this morning in the main street of Adeje town, a few miles inland from Playa de las Americas. It all started at noon as a cast of 100’s gathered at the top of the street, dressed as Roman centurions, the Roman emperor, the disciples and the followers of Jesus. You couldn’t ask for a better setting, the lampposts and balconies draped with red sashes, the palm trees lining the pavement as it twists it’s way down to the main square and crowds packed on both sides of the road. First off were the centurions, on foot and horseback, heralding the emperor and his wife carried in luxurious splendour. 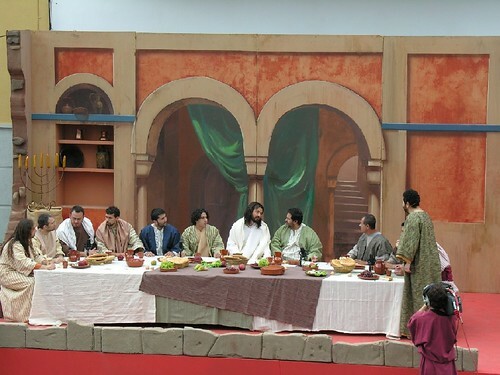 The followers, in sandals, kept their composure despite a few hazards left behind by the horses.Â There was a series of tableaus set up down the street that staged key scenes, starting with The Last Supper. The key players were all wired with microphones and their interaction andÂ strident music was relayed over P.A systems all down the road to add to the spectacle. As the crowds pressed for better vantage points, the greatest story ever told, unfolded, the court scene raised the tension as Jesus was sentenced to crucifiction. The guards seizedÂ and stripped him nefore whipping him. As disciples and supporters wailed and protested, Jesus was forced to take up his cross and march it down the road to the plaza. Once there, he was held down as the nails were hammered in and the cross was raised high, watched in sombre silence by the crowd as television cameras relayed the scene to a giant screen and fedÂ a live Canarian TV broadcast. Jesus’s cries of forgiveness from the cross Â brought tears from many of the enthralled crowd, before his moment of death and the cutting down of the body. If that sounds dramatic, it’s a real understatement, the whole thing was expertly staged and performed and even a cynical old git like me was moved by it all. 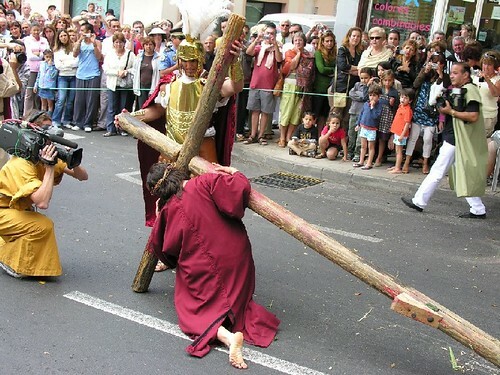 If you look carefully at these photos you will see that the actor playing Jesus had just a small wedge of wood on the cross to press one foot against to support his weight, the hands hanging limp within the ropes, any slip during his lengthy stint on the cross could have been very painful. The wholeÂ 2 hours was a real tour de force and other similar enactments were taking place across the island, a real show of faith and commitment. There’s always plenty going on in Tenerife, and lots of new attractions. A good 2-1 home win for CD Tenerife on Sunday in Santa Cruz rekindled outside chances of promotion to the Primera, the promised land of Real Madrid and Barcelona. The win of course was marked by a few cheeky Dorada’s. 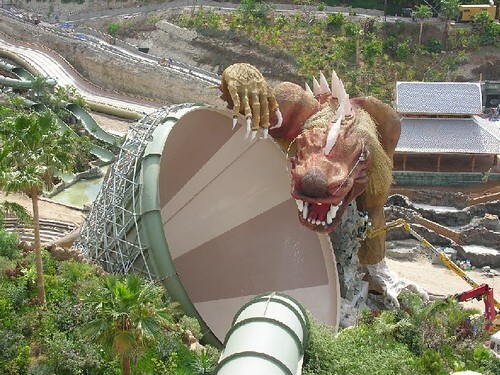 Fast forward to Monday morning and there I was at the top of The Tower of Power in Siam Park, the Adeje water kingdom, that opens on May 1st. The 28 metre slide to a pool below wasn’t quite what the morning after tummy wanted but I stood my ground, took my photos and edged warrily back down the 256 stone stairs, at this unfinished stage, very open to the breeze. I had arranged the sneak preview for The Tenerife Sun, and it included meeting Christoph Kiessling, the boss, and creative genius behind the new park. The lovely Romy, from the sales office was also on hand and together they gave me a full tour of the impressive and slightly daunting attractions. The Dragon looked and sounded suitably scary with the promise of a rotor like spin in both directions and zero gravity, and the expanse of white sandy beach stood out although the wave tower was turned off, so no 3 metre waves on that day. Just a few days earlier, I was looking at a very different new beach (corny link no 157) this time in Playa San Juan, where the 3 million euros project was coming to completion. I know work can be slow here but it is nice to see such a pleasing end result. 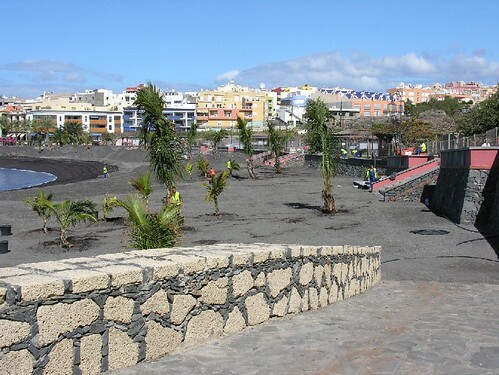 Workmen were still swarming over the beach, raking and grading it, as old Canarian men made early claims on the seating areas by the path, and looked on approvingly. Nice place Playa San Juan, it deserves the new beach, Guia de Isora council are pretty go ahead and have made a lot of effort to improve their municipality. The walkway behind the new beach extends round the headland past a cave worn into the rock, on to a more rural beach. After my visit, I walked off to the west along the other shoreline path that links to Alcala and realised that my memory had over estimated how easy it was to climb, crawl and balance past the tricky half way point that can be avoided with a detour through Fonsalia. There’s more on the Alcala stretch further back on this blog, just enter exploring in the search and it will be closer to hand. Anyway, like Siam Park, the San Juan visit was for The Tenerife Sun, now under new ownership. Follow the links to the first re born issue to find the 2 location reports (Siam-property page12, San Juan-property page 15)Â plus my news on 2 concerts in Scene Around and a match report on CD Tenerife (sport),Â among all the other goodies. Is Santa Cruz transport Up the Junction? Something had to give. It was clear when the new, and I must say excellent, tram system was being installed, that it couldn’t please everybody, and now 9 months down the line, taxi drivers and the Titsa bus company are feeling the pinch. The tram has been a big hit, sleek and stylish, fast and direct and with 8 million passengers paying 9 million euros in fares already, Â it has answered a lot of critics. The Cabildo owned Titsa bus company have made several complaints, routes disrupted to allow the tram a smooth passage and of course dwindling passengers, a potential threat to jobs. 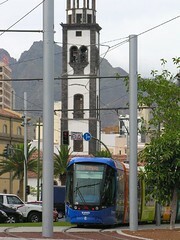 They have just hit back by slicing 10 minutes off the 015 service between La Laguna and Santa Cruz, making it’s 20 minute trip a bit faster than the tram but the flash new kid in town calls at many more stops on a long winding route. But the loudest squeals are coming from the taxi companies, especially those in La Laguna, who have denounced their big city neighbours for crossing their boundaries to poach some extra fares to make up for their losses to the tram. La Laguna has 400 licensed taxis and Santa Cruz has 1.087, and at the moment the only hand signals they are exchanging are two fingered ones. Things got a little more tense this week when Radio Taxis of La Laguna had their aeriel transmitter cable cut, putting 300 drivers out of action while the repair was made. No direct accusations have been made but it all adds to the spirit of mistrust. Whatever happens next, there is bound to be a lot more clenched teeth, blasted horns and frantically rung bells before peace breaks out on the mean streets of the municipality. It only seems like the other week that I popped over to Las Galletas to see the progress of the new marina (scroll down 9 stories) but paying a return trip yesterday, I found it open to the public, so do join me for a viewing. 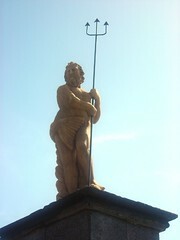 King Neptune stands proud, trident in hand, high on his plinth, at the Marina del Sur, the new addition to the Las Galletas shoreline. 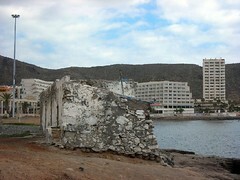 It’s a pride that will soon be shared with the local fishing trade and visiting tourists to this thriving Arona village. 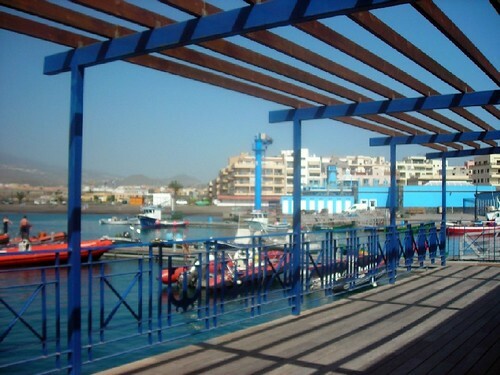 The outstretched embrace of the marina, seperates the sand and pebble beach from the promenade of cafes and bars, and although it still needs some fixtures and formalities before it is in full use, there is plenty to impress. Already the four pontoons are fully moored up with boats and pleasure craft, and the farther of the two large pavillions, has an occupied maritime office looking out to sea. 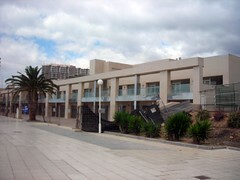 The old police station on the shore has been demolished but a new Policia Local office is just along the new boardwalk. Don’t worry that all tradition has been swept away, the rusty old iron canon, guarding the shore, has just been shuffled a few yards nearer to the beach. Las Galletas is very much a working village, but modern commercial pressures have made it hard in recent years, for fishermen whose families have harvested the sea for generations. It’s time they had a helping hand, and the marina will see to that. The old wooden stalls on the shore are cramped and in disrepair, but have had to do for selling points for their catch of each day. 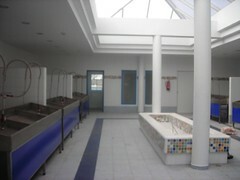 Now there is a bright modern Pescadors Centre on the marina, where the fishermen can wash, gut and sell their fish. It’s good news as well for tourism, a growing source of income for Las Galletas. The marina is not just functional, it’s stylish and attractive, from it’s blue and white colour scheme, right through to the small touches like old Neptune keeping guard, and anchor designs in the metalwork of the railings. The first pavillion, at shore side, has commercial units ready for occupation and an open roof terrace that will make a great cafe to view the area from. There are two toilet blocks along the boardwalk, with disabled facillities, and while the lamp standards will make it an inviting evening walk, inset ground lights will clearly mark the edges and stop feet from straying too far. Add in some marble benches at sutable intervals, and large flower urns, and it’s clear that this will be a welcome addition to Las Galletas. There’s a new discount and loyalty card available across the 7 Canary Islands, and this one doesn’t have the usual sting in the tail. As the latest promotional effort, Promotur, the tourism agency for the Gobierno (government for all the islands) has come up with a free pack aimed at tourists, that contains discounts for 2,000 Canarian outlets. The idea is you fill in a questionaire about your holiday and previous trips to the islands and your card is activated. Along with the card, there is a map and a booklet listing all the outlets and what they are offering. The holder and their “companian” can both use the card and each time they do, a point is credited to their account number. At some stage in the future, a catalogue will be issued showing gifts that the points can earn you. Okay, that’s the deal, is it any good? Firstly I must sayÂ I came across it at a tourist information centre,Â I haven’t seen it mentioned in any media outlets, I assume it will be pushed at airports etc as well. 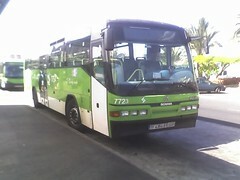 All the info is in Spanish, German and English and there is a website www.turismodecanarias.com and a phone number 902105480. Most of the discounts are about 5 or 10 per cent but some are little extras, like a free vehicle upgrade on car hire. It’s a good idea, it’s always good to see the government making some effort to help business’s in these lean times. I’m a bit concerned that I haven’t seen any posters or mention of it in the media, but maybe that will follow. Please don’t let it turn out like the banana idea last year when tourists arriving in Tenerife were supposed to get a little pack of bananas on arrival with some information sheets concerning a new helpline, it never happened in the end, apparently because the phoneline was hardly used – maybe because no one knew about it. It’s also a bit worrying that the card is free as part of a “launch promotion” the pack it came in had 10 euros marked on it, can’t see anyone forking out 10 euros without knowing any of the outlets. Anyway, brushing aside my natural cynicism, more power to the tourism department, it’s going to be a tough year for many business’s and anything that can help will be very welcome.